Kind of sounds like I'm calling someone a name, doesn't it? LOL! 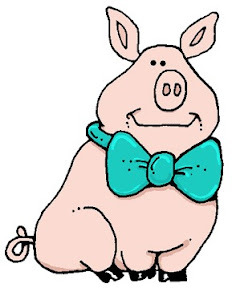 It's Wednesday and it's time to head over to the Hambo Hoedown to see what the Bacon Bits came up with this week! We are featuring this cute little guy... Artist Pig and we are using a sketch to showcase it. I used some unknown papers that I had and used a flower cut off from some ribbon I had in my stash finished off with a brad. A very colorful card made for this image for this week! Don't forget to take a peek at what the other very talented Bacon Bits created! Thanks for stopping by! First, I want to take this moment to thank my husband for his service a dedication to the United States Army! He, alongside all the soldiers, sailors, marines, airmen, and the Coast Guard, display selfless service to our country to ensure that we are safe and have the rights to all we are entitled to. 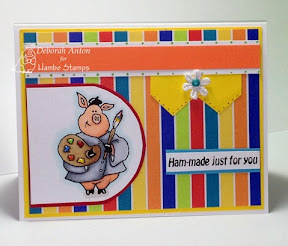 I'm so excited to share with you that I have decided to stay another term on the design team of Hambo Stamps! Yes... I am able to play in the pigpen as a Bacon Bit again!! Woot! A big thank you to Hambo Stamps for asking me to stay! I have been enjoying every minute of my time with this team! 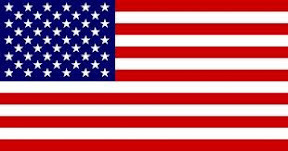 I hope you all have a fantastic holiday and please do not forget to take a moment to remember all the service men and women who have made the ultimate sacrifice in securing our freedom we all love so much and why this day is so important! Happy Memorial Day! I do hope you all are having a safe holiday weekend and keeping those who are serving, or have served, in your thoughts as they continue to fight for our freedom we so enjoy! Furthermore, I hope you will take a moment to remember those who have made the ultimate sacrifice in protecting our country with honor. 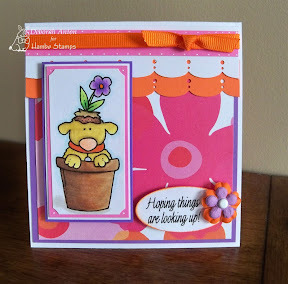 Today I am sharing with you two cards I made using Hambo Stamps digi images from Hop Art Designs. 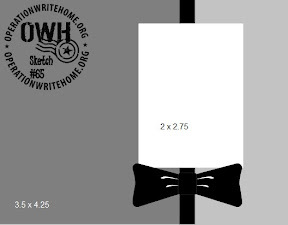 Hambo Stamps donates a portion of its proceeds from Hop Art Designs to this fabulous organization we are all hopping for- Operation Write Home (OWH). You will want to be sure that you start at the beginning by clicking the link so will be able to move through quickly and smoothly. 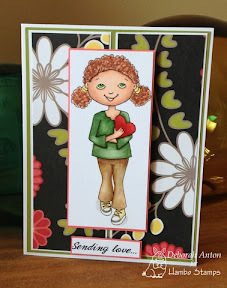 This card was made using OWH's sketch #42 and the image called Trena with Heart. American Crafts dp was used. I colored in the image with my Copics and added the sentiment to the bottom. 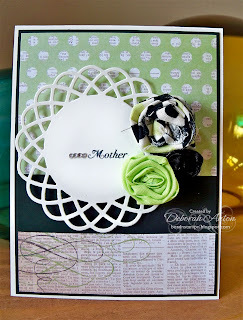 This card was made using OWH's sketch #65 and the image called Daisey's Due. Basic Grey's collection of What's up for the dp was used as well of some gorgeous colored crochet ribbon and card stock from Lilly Belles Paperie. The image was colored in using Copics. Thanks for stopping by and taking a peek. Thank you to OWH and everyone for your continued support to our troops! 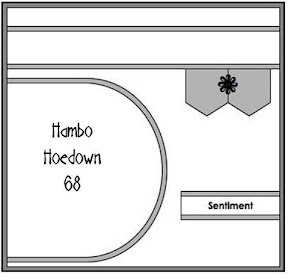 Time to Hoedown with Hambo! 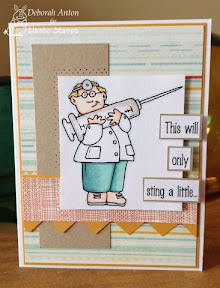 The challenge for this week is to show off Dr. Needle and his piercings! Paper piercings that is! I used the new Basic Grey collection of PB&J and colored in the image with Copics. 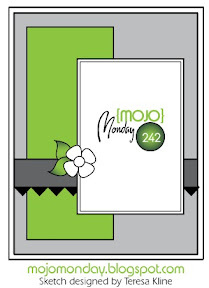 I used this weeks Mojo Mondays sketch for the layout while piercing along the middle panel. I didn't think a flower fit into my card and I really didn't have an embellishment that fit the bill, so I went without. 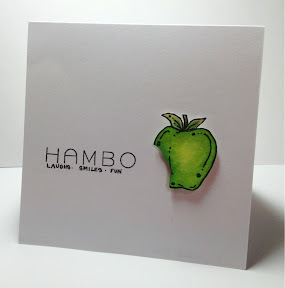 We hope you play along with us and have a chance to win some free images from Hambo Stamps! Thanks for stopping by and taking a peek! Whew!! We have made it through another school year and it couldn't have ended better!! My boys both ended with another Honor Roll listing and we found out today that my husband is getting promoted to Lieutenant Colonel! We are so proud of everyone! Thanks for stopping by and I hope you are having a great day!! 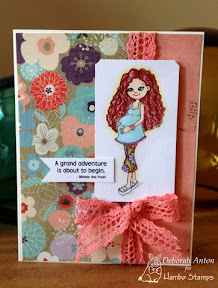 Welcome to the "Channel Surfing" Blog Hop sponsored by Hambo Stamps! 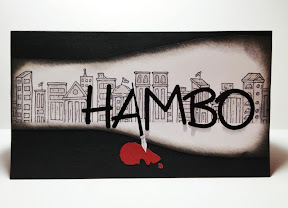 Today Hambo customers and the Bacon Bits Design Team are bringing you fun creations that depict TV show titles! It might be our favorite show, or just one that was fun to design. Deborah -------------> You are here! A prize will be awarded to one participant whose TV-themed creation tickles the Bacon Bits’ fancy in a hammin’ jammin’ way! Another prize will be awarded randomly to a hopper who comments on all the blogs along the way. The winners will be announced on the Hoedown blog, as well as on the Hambo company blog, Talk to the Ham, on Wednesday, May 23. Any idea what show this could be from? I have gotten hooked on this years new show "Smash." I created this card using a few of Hambo Stamps digital images on Photoshop. I tried to keep the coloring the same as shows' title and that made for coloring this pretty easy! The letters were stamped and cut out using Blingbet from MFT. I then added some rhinestones to the letters. How about this one? Oh... This is dh and my favorite show! This was made to replicate the TV show "Castle." I used Hambo's rubber stamp of Skyline and some alphabet stickers from Paper Studio for the title. I cut out the pen from a printout of the actual show title and added some Sakura Glaze pen in black over it. The "blood" is some cut out from my MS Halloween paper pack I had. I sponged around the edges and colored in the city with my grey Koh-I-Noor pencil. Now, change your channel to Karin's blog and share some ratings with her! Thank you for stopping by here and enjoy your TV time! This image is called Monster Yell and he means business! For this weeks challenge, its a sketch challenge! For my card, I utilized some dp I have had for such a long time, I forgot I had it! It is from Flair Design. I colored in the image with Copics and lightly traced over him with my smaller Nestie oval die to have some of his body parts stick out once I cut around. I then added that to another oval to mat. I had some coordinating printed twill ribbon I used for the sentiment mat which I decided to make it into a partial slide. 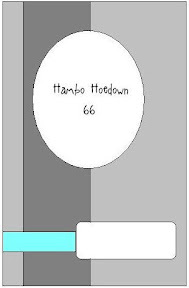 Be sure to head over to the Hambo Hoedown Challenge Blog to play along and to see what the fabulous other Bacon Bits designed! Also, don't forget our customer blog hop Friday! It is Channel Surfing and it is sure to be a blast! So what special plans do you have planned for Mother's Day? I am left in the dark as to whatever plans my family may have in store for me, but I would be happy just being at home with them all! I hope your Mothers Day tomorrow is fabulous! With that said, I know I mentioned in my post yesterday that I had two more teacher's gift to share, I really only have one more! :) But I will save that for Monday! Today, I want to share two Mother's Day cards I made with the left over fabric I had from the teachers bookmarks. I say it quite often, but I love simplicity and this is just that. 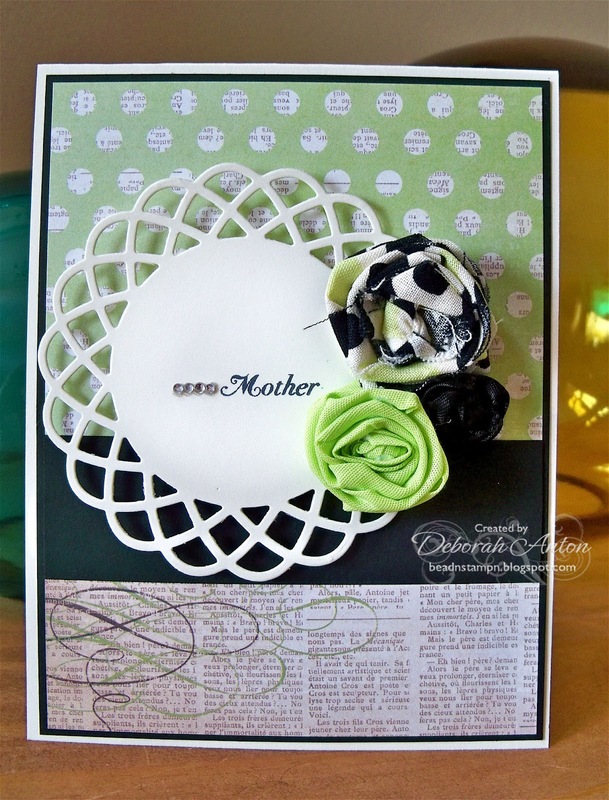 I used MFT's Doily duo Die-namics for the center panel while the dp is from MME. The sentiment is stamped using PTI's Mixed Messages. I did finish the inside of both with the same dp and the sentiment 'with love.' Again, super simple and pretty! 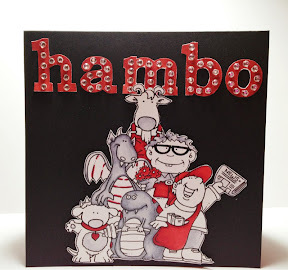 Thanks for taking a peek and I want to share that next Friday, May 18, Hambo Stamps is have thier customer blog hop of "Channel Surfing!" You don't want to miss out on what the Bacon Bits as well as Hambo's customers have in store for you in creating some awesome TV Show titles using Hambo Stamps! Mark your calendars! As I mentioned, this week is about the teachers! They so deserve this week... they do such an important job next to parenting! This project I made was another simple one I created. 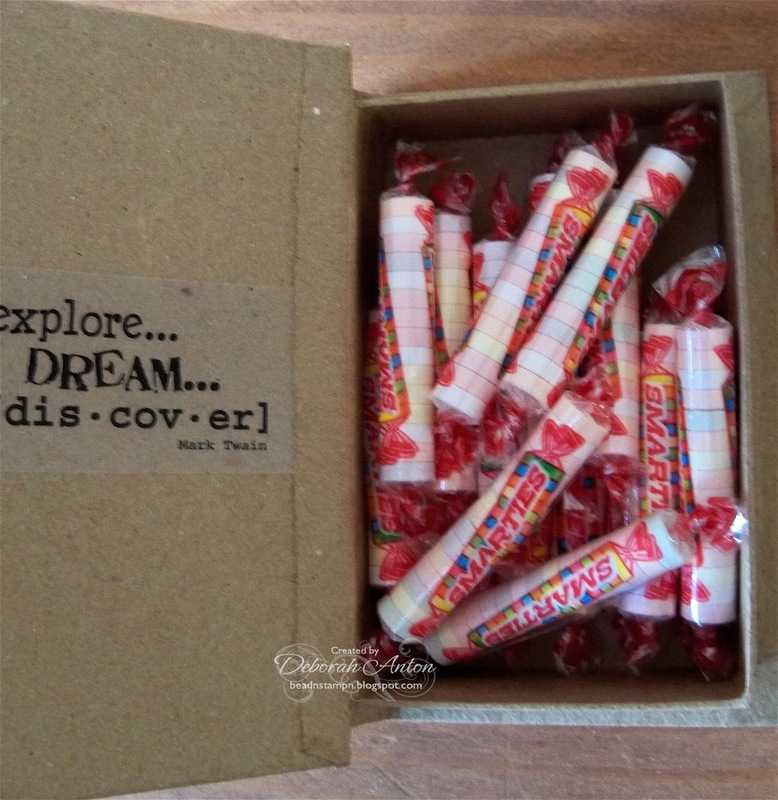 I had seen before some gifts made with Smarties candies with this cute saying in a jar or bag. I thought it would be a nice presentation to give these candies in a paper mache book box decorated with fabric and fabric flowers, which would include a matching fabric bookmark! I really liked the simplicity of the plain box, so I did not cover it with any paper but added some the fabric to the spine. 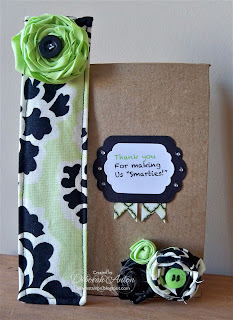 The bookmark is so easy to make and of course, I did not keep to the orginal instructions of just fabric! I had to add some chipboard inside to keep its shape! :) But I am glad I did. I would be happy to give instuctions if you so care to know how to make it, just email me. For the rossette at the top, I used some seam binding to create it and added a button to the center. I used more rossettes made for the corner of the box and typed the sentiment on my computer, cut out with my nesties. I added a few fish tails to the bottom of the sentiment using MME dp. For the inside of the box, I filled it with Smarties and added a sticker from SRM Stickers. Easy and fun!! I hope you all have a great weekend and I two more projects to share tomorrow and Monday!! I will end the teachers gifts there! lol!! Thanks for stopping by! 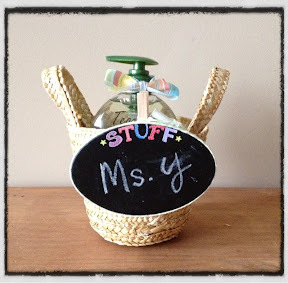 I have a super simple fun teachers gift to share with you today. I cannot take credit for this original idea, but the actual craft I got from Brown Paper Packages. A few people have replicated this project but I never saw one done for a teacher. So, I created my own template with words. I will explain how to make this at the end. So how do you do this? Well, you can do this with soap or hand sanitizer. First, you will need a laser printer or copier to print your words on the transparency. If not, the ink will run into the soap/sanitizer and that won't make for a pretty presentation. Once you have your choice liquid, you will need some Goo Gone to take the stickers off the bottle. Then, create your template of words you would like to use in the bottle. Some other ideas be a monogram, family name, something humorous, the list goes on! 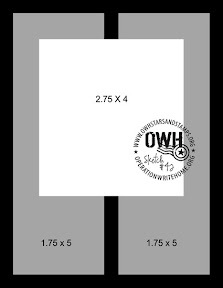 Print your template on the transparency and cut to size. I have found that if you leave the cut out just a little bit larger than the actual front size of the bottle, it will stay better and not have the tendency to lean over a bit. To get the transparency in the bottle, just roll your cutout from the backside and tuck in the bottle. Use the pump to help maneuver it around to your spot. That's it! 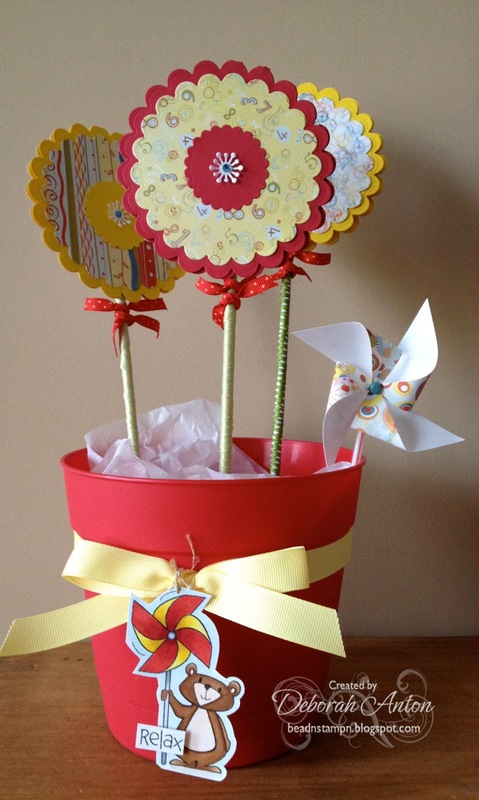 Add some ribbon or put in a basket like I did and your gift is ready to go! Thanks so much for stopping by and taking a peek! 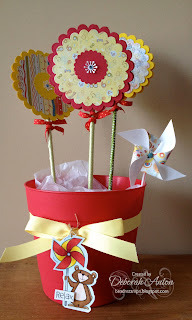 I will have another fun and easy project tomorrow to share with you for teacher! 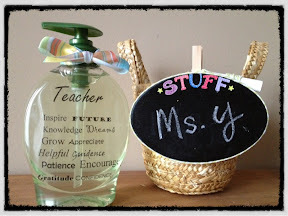 This week, it is all about the teacher! :) Have a great day! Anyway... It's Wednesday and it's time to Hoedown! 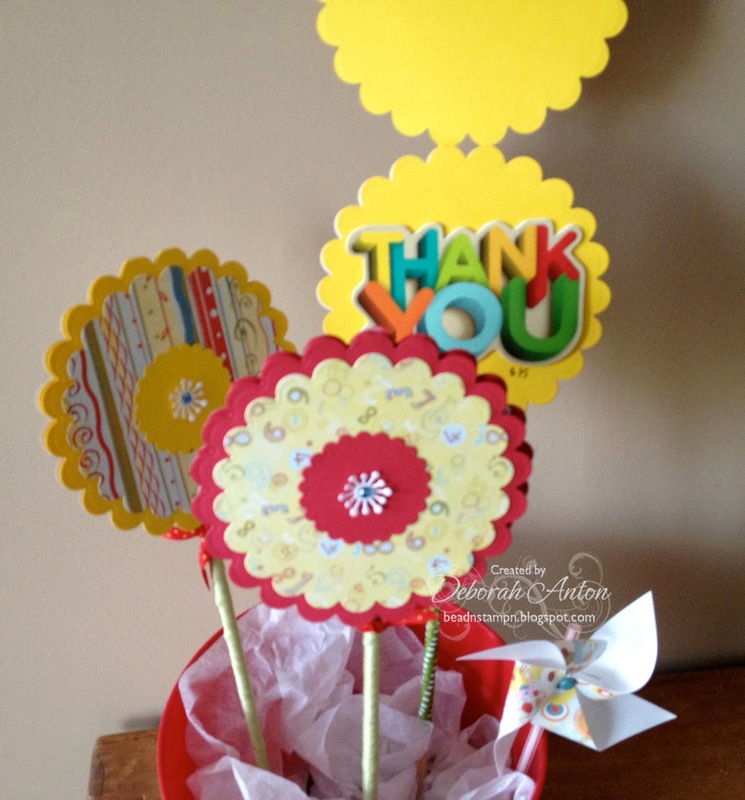 The challenge is to make a card using flowers. When I received my image, I instantly knew I wanted to create a scene with him. I colored Henry (I named him) hee! With Copics and cut him out. The image stops with the butterfly, but this sentiment was positioned just right to where I could add my dots of flying from the butterfly to the sentiment to keep it as one. I cut out the grass with my MFT die-namics grass die. I then used my Cats Pajamas cloud border die for the clouds. 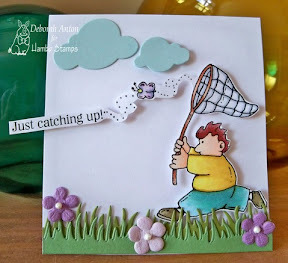 I finished off the card by popping up Henry and one cloud and adding some mini Primas to the grass. The center of the flowers is liquid pearls; something that I haven't used in a long time! We hope you play along to give those Hambo images a run for their money! 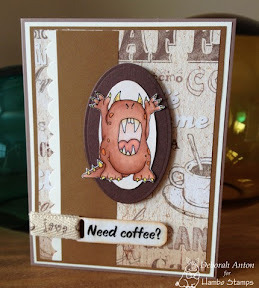 Hambo Stamps is having a customer Blog Hop! The theme is “Channel Surfing.” Using any Hambo image, either rubber or digital, create a project that represents and depicts a TV SHOW title! Maybe it’s your favorite program, or maybe it’s one that you don’t even like! Whatever it is, we want to see your TV Show creations! The hop is scheduled for Friday, May 18, and is set to go live at 7:00 AM CST. All blog hop posts must stay at the top of the page for that whole day. A prize will be awarded to the customer whose TV-themed creation tickles the Bacon Bits’ fancy in a hammin’ jammin’ way! The winner will be announced on the Hoedown blog, as well as on the Hambo blog on Wednesday, May 23. If you are interested in participating, please email Judy at hambodesignteam@gmail.com by 11:00 PM CST on Friday, May11. Sample blog copy for the hop will be available after you sign up, if you desire to use it. Come channel surf with us and don't miss out on some great "shows!" Thanks so much for stopping by today? Your comments are appreciated and be sure to see what the other Bacon Bits came up with! Have a great day! Sorry this is such a late posting! It was airport day... Family is headed out and now it's back to routine! 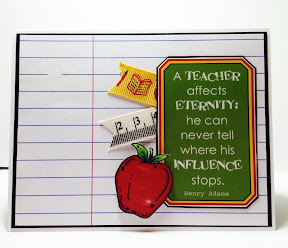 Today's card is one I made for one of the boys teacher for the start of Teacher Appreciation week. If you are a teacher, thank you! You all make such a difference in a child's life! 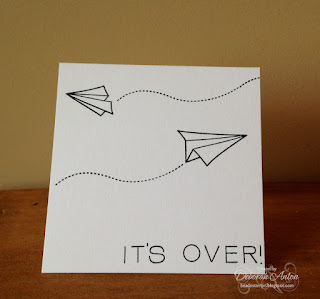 This card is made using some paper from Paper Studio and ribbon from Ribbon FX. The main sentiment is from SRM Stickers while the apple is a soon-to-be discontinued stamp from Hambo Stamps. I colored in the apple with Copics and popped it up over the sentiment while I took small bits of the ribbon and added it to the side. Something simple and straight to the point! :) I mimicked the inside with the apple and paper to match with a simple Thank you! I hope you all are having a great start to your week! It's so hard to believe that the kids will be out of school soon! Why won't time slow down a bit?! Thanks for stopping by for a looksie! I was able to finish up a teachers gift for next week- an altered mini clipboard with a notepad. I used Cosmo Crickets Boyfriend collection for the paper to cover the clipboard with Modge podge. I then used the coordinating paper for the inside of the pen. On the bottom of the board, I uses letter stickers to write out the teachers name. I then wrapped it up with ribbon and added a tag made with MFT's A la mode set. I have something planned for everyday next week for the teachers, so I apologize of you are bombarded with teachers gifts!! I hope you all have a great Friday and weekend!! Thanks do much for stopping by!! Another cute Bailey to share with you! Flower Bailey! He is just the cutest! Come join us for this weeks Hoedown Challenge! This weeks challenge is to use the seasons hot colors of purple, orange, and hot pink. So much color to show off! The image is colored in with Copics. 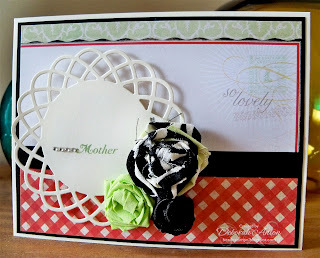 DP is Paper Studio while I used my MS border punch for the scallops. I finished off the card with some Primas I had used with a mini brad. Hambo Stamps is accepting applications from now until May 16, 2012 for new Design Team Members. Hambo is looking for designers for the next four-month term: June 1 - September 30, 2012. The new Hambo Team will be announced beginning May 24. All designers must be comfortable working with rubber and digital images, as each designer will work with rubber for 2 months of their term, and digital images for the other two months of their term. hambodesignteam@gmail.com by May 16, 2012. Put Hambo DT Application in the subject line. 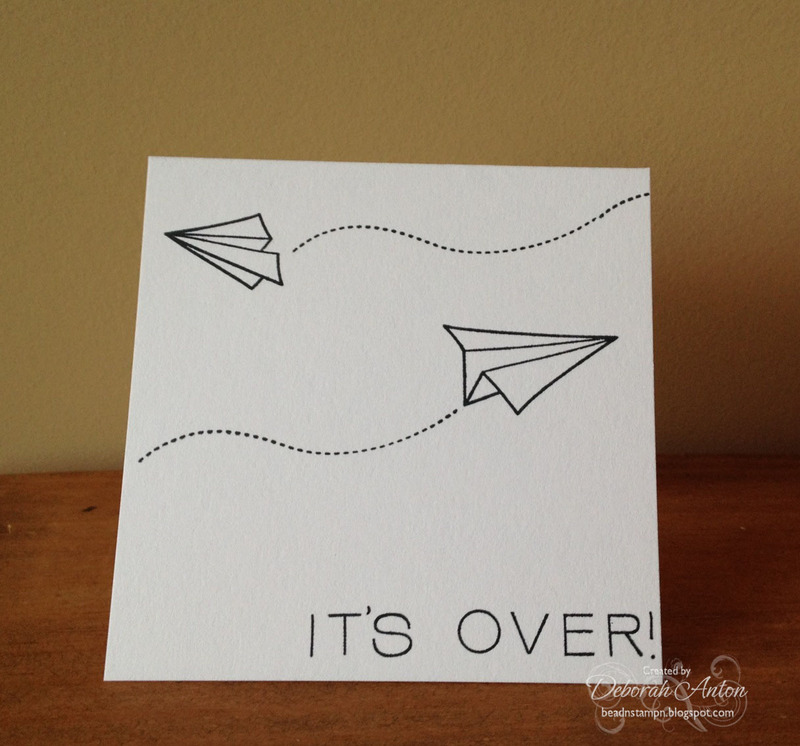 In addition to your blog & gallery links, please attach jpeg photos of three of your best stamped projects. All application items are due by May 16, 2012, 10:00 PM CST. We are looking for designers that can work with deadlines. Hambo is also looking for designers who can follow directions, so please be sure your application contains all requested information. So if you want to be part of a fantastic company, this is it! Good Luck!